Create exciting, tasty and healthy meals in minutes with our quick and easy organic meatbox. Packed with different flavour-packed meat each week, we choose the cuts to suit busy people who don’t want to spend hours in the kitchen. This meatbox is all about delivering maximum tasty results in the minimum amount of time. The meat will be ideal for frying, grilling, griddling or turning into a quick meat-based sauce or juicy homemade burgers. From succulent lamb chops to tender beef stir fry and from flavour-packed beef mince to homemade sausages, you’ll be able to rustle up quick and tasty after-work suppers with the minimum of fuss. 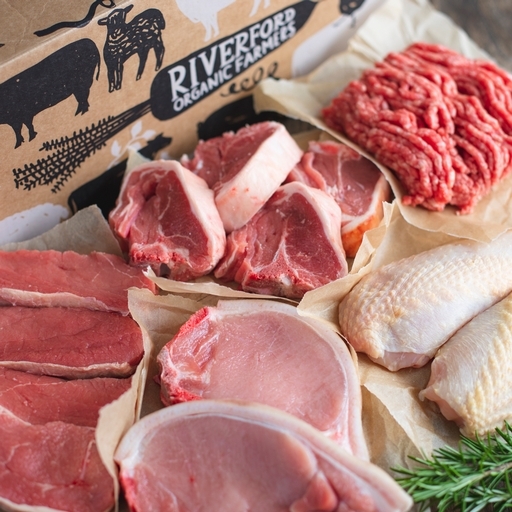 All of our meat is sourced from small scale approved organic producers whose animals enjoy the highest welfare standards. In fact, we are proud to have received awards for our ethical sourcing from both the RSPCA and Compassion in World Farming. Our poultry and animals are reared in the traditional way: in free range groups that roam and graze on organic pasture. They reach maturity slowly and naturally which, we think, makes the meat particularly tasty. The meat is then carefully hung and matured, for flavour and tenderness, before being prepared by our own skilled team of butchers.